If you're looking for Mediterranean Style House plans, I wrote this page to help you decide whether or not this house plan style is right for you. So to set the scene we’ll go over some of the common features of the Mediterranean Style, then we’ll go on to discuss factors to consider if you’re thinking about going for this style. Mediterranean style house plans are inspired by architecture from (get your atlas out) Spain, Italy, France, Greece and Morocco. Sunny states like California and Florida are the perfect environment for Mediterranean style homes. Although the style is named after the sea this style of house can also fit in well in the countryside of Texas or the mid-western states. Low pitched tiled roof often using red tiles. Stucco exterior walls painted in colors which complement the surroundings. Use of columns to hold up porticos and balconies. I hope my little sketches communicate the style of this type of home! Is a Mediterranean style house plan suitable for your home? Here’s some points to consider to decide if a Mediterranean house plan is for you. Flexibility – The architectural elements, especially the tiled roof are what makes a home have a Mediterranean style, and there’s no style rules about the position of a chimney or symmetry that act as constraints so the design, both internal and external, is very flexible. What else could a Mediterranean style home plan be apart from laid back! Lot Shape – This style lends itself more to lots that will allow space around the house. Think villa (even it if is a small villa) rather than town house. Lush gardens are often a feature of these houses in Europe so it’s s shame not to have room for a garden. Sloping Site – Homes with strong architectural style signals like columns and tall porticos will draw attention away from a sloping site. A drop in roof level adds interest to this style of home rather than making it look messy. Scalability – It’s rare to find a Mediterranean style house plan less than 2,500 sqft and there’s really no limit on the size at the upper end of the scale. Expansion Potential – Because of the low pitched roofs there’s no potential to expand upwards. The style of the house almost invites complexity so it shouldn’t be too much of a problem to have an addition in mind for the future. Cost of Construction – The style can be quite complex with complex shapes that result in lots of roof lines which pushes costs up, but on the plus side tile is cheap. Spanish style haciendas tend to have more simple shapes which would be less expensive to build than Italianate styles. Generally Mediterranean house plans were inspired by the homes in the Mediterranean region, due to similarities with climate rather than being a style introduced by settlers, (although I’ll let the Spanish have their Spanish Colonial style). Why reinvent the sunny house wheel when there is lots of inspiration to go at. The style was first introduced around the turn of the 20th century. Here’s two examples. 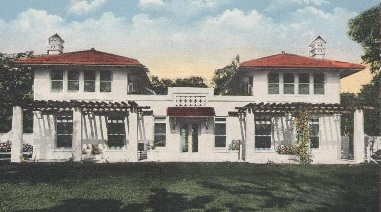 Architect August Geiger created this Mediterranean revival style home in Florida. 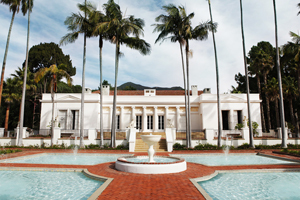 Architect Bertram Goodhue designed a residential Greek Temple! Here's some more house styles for you to look at.